There are few designers who are as conceptual as Solange Azagury-Partridge. The London based jewelry genius got the initial idea for her latest work from one of her favorite books, the cult classic, Supernature. Written by Dr. Lyall Watson in 1973, the publication puts the world’s wonders in scientific terms. “It’s quite mind blowing,” says Solange. For her collection, Solange transformed the science into an amazing array of jewelry based on the five elements Fire, Water, Earth and the Aether, the essence once believed to permeate space and link us to the universe. 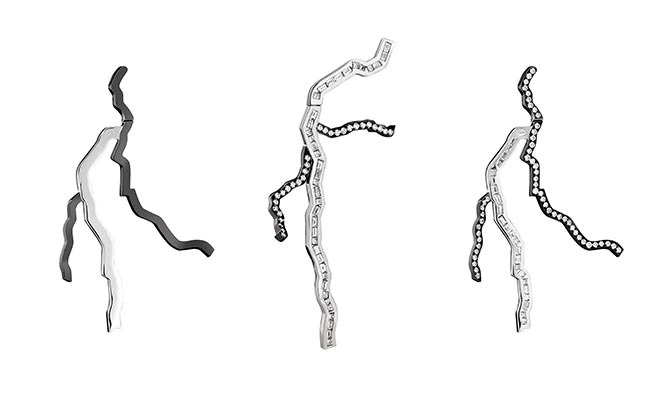 Fire is represented by the most, um, striking pieces in the Supernature collection. Lightning bolt jewels represent an electric fire style. As opposed to the emoji-like renditions of lightning usually seen in jewelry, Solange’s look like the real thing. They are set with round and baguette-cut diamonds in blackened and white gold. 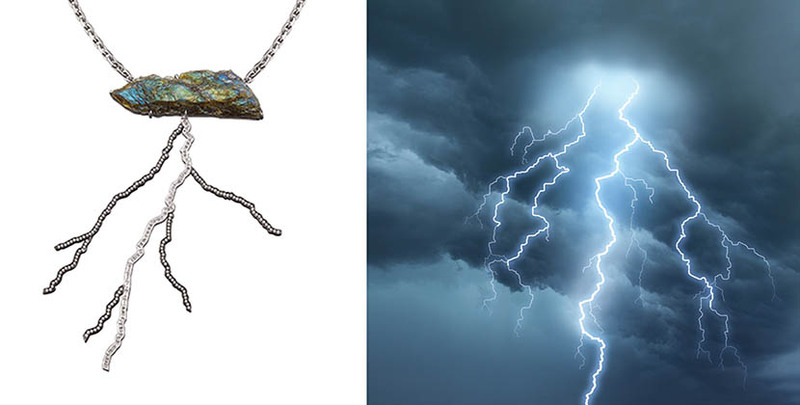 The centerpiece is a necklace featuring a chunk of labradorite with lightning bolts shooting off of it. “There is quite a lot of iridescence in the stone so it looks like a storm cloud,” says Solange. Some astonishing rings represent several of the elements. The Phoenix ring, a Fire piece, has red gold flames shooting up around a Spessartite garnet. A ring with an emerald surrounded by leaves symbolizes the Earth and specifically ferns, one of the most ancient plants on the planet. Another Earth ring has sprigs of lavender in gold growing around an amethyst. 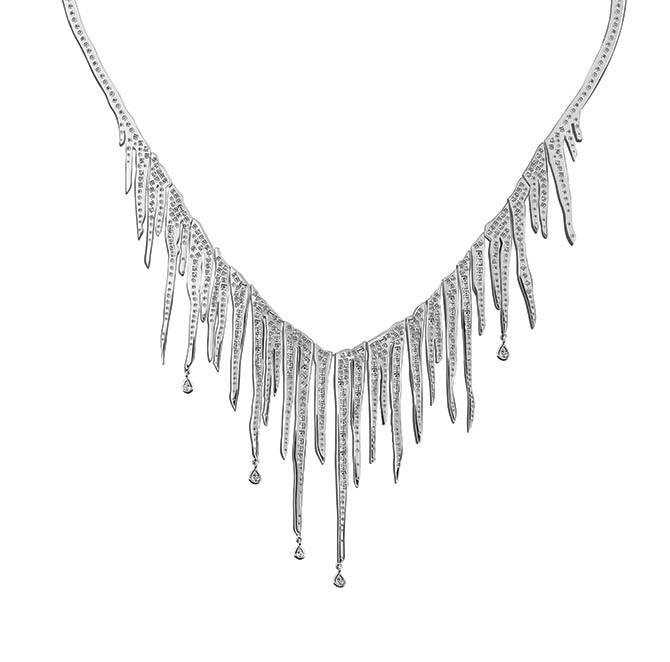 Solange puts a fresh spin on formal diamond jewelry with the astonishing asymmetrical Icicle necklace that represents water. 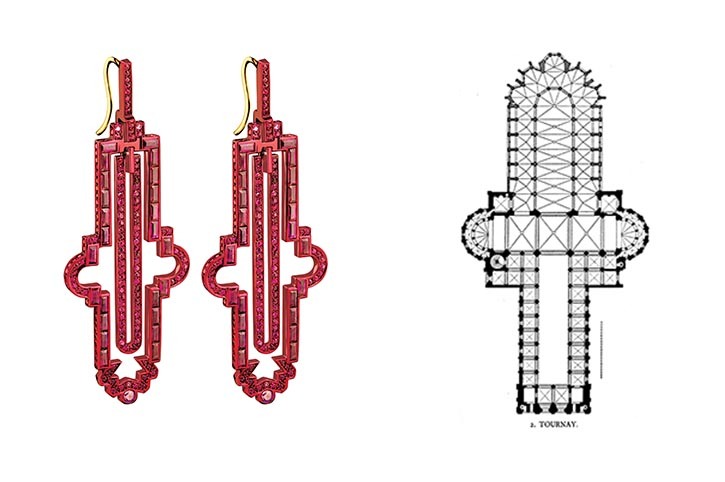 As for the Aether, an invisible sort of force of nature, Solange, created earrings depicting the outline of architectural blueprints of five places of worship. One of the most immediately recognizable is the cathedral at Notre Dame. Only Solange could have conceived and executed all of the Supernature ideas in such a heavenly way.